This stunning Victorian Farmhouse design with a wraparound porch takes you back to a time when families would gather around the large porch, chasing the sun or shade, sipping on a cool homemade lemonade while watching the children play. This home offers 4 to 5 bedroom, a soaring 2 story high Great Room and a Media Room option upstairs. You'll enjoy the gorgeous custom kitchen and the spacious Master Suite with a walk-in shower. Flex Rooms include optional Office, Den, Nursery and Media Bonus Room. The "Avalon" is a stunning Tuscan / Andalusian architectural masterpiece coming to Legacy this June/2016. The fabulous interior will be finished with a comfortable and edgy transitional “Rustic Modern Interior" style. This single level home, one of several featured in our Tuscan series, features 2,850 sq. ft. with 3 to 4 Bedrooms plus an Office/Den Flex Room and Media Room option at the 4th Bedroom. Our homes typically get multiple offers once they are completed so put this home on your list! Competitively Priced at $459,900, compare our Location, Curb Appeal, Landscape Design, Interior and Exterior Features plus our 2 Year Warranty to other new homes, and we think you’ll agree, this home is a great investment! We extend our warranty up to 4 years on appliances and mechanical items such as, the water heater, AC and heating unit. This property is located in Eagle's Legacy Subdivision on a quiet, low-traffic street on Lot 5 Block 7 on N. Luge Avenue. The lot measures 90' wide by 133' deep. The rear yard will measure approximately 40' deep from the back of the house and face west. There are 2 patios, one of which is a shaded side courtyard and ensures a very private setting. 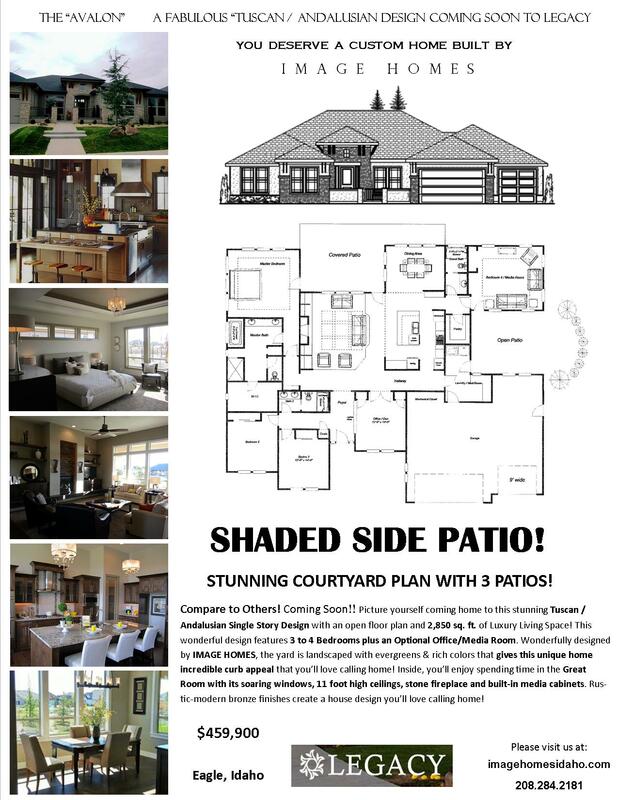 This home also welcomes you and your guests with a shaded Courtyard Entry and yes, we think it's the best new home deal in the Eagle new home market!! The "Santo Stefano" is a fabulous new single story Tuscan masterpiece coming to soon to Legacy this June/2016. The fabulous interior will be finished with a comfortable and edgy transitional “Rustic Modern Interior" style. This single level home features 2,900 sq. ft. with 3 to 4 Bedrooms plus an Office/Den Flex Room and Media Room option at the 5th Bedroom. Our homes typically get multiple offers once they are completed so put this home on your short list! Competitively Priced, compare our Location, Curb Appeal, Landscape Design, Interior and Exterior Features plus our 2 Year Warranty to other new homes, and we think you’ll agree, this home is a great investment! We extend our warranty up to 4 years on appliances and mechanical items such as, the water heater, AC and heating unit. The "Kirkwood" is a stunning Sun Valley style architectural masterpiece featuring multiple patios and view windows.This single level home, one of several featured in our Mountain Craftsman series, features 2,766 sq. ft. with 3 Bedrooms plus an Office. Compare our Location, Curb Appeal, Landscape Design, Interior and Exterior Features plus our 2 Year Warranty to other new homes, and we think you’ll agree, this home is a great investment! We extend our warranty up to 4 years on appliances and mechanical items such as, the water heater, AC and heating unit.